Today I am hosting the second of the live discussions at SL15B and this one applies to everyone. 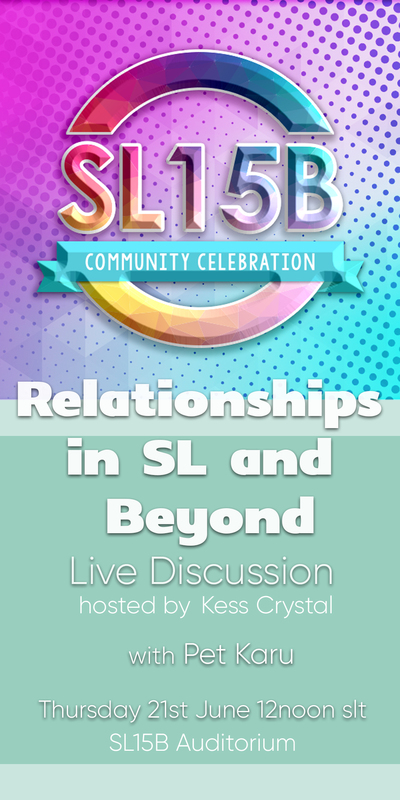 I will be joined by the inspirational Pet Karu who leads a weekly discussion groups in Second Life on the subject of Relationships in SL and beyond. Second Life is a social forum and how we interact with others is at the very core of our enjoyment in SL. Whether those are work relationships, intimate relationships or friendships, learning more about ourselves and we interact and empower ourselves within those relationships can be thought-provoking and revealing. Find out more today, 21st June at the SL15B Auditorium for what promises to be an insightfull and interesting conversation.